Jointly developed with Astrodon, and purpose built to fit into the optical window of their Rowe-Ackermann Schmidt Astrograph (RASA) Telescope, Celestron's Light Pollution Imaging Filter selectively removes unwanted light pollution while allowing more overall light transmission to pass through the optical path to the imaging sensor. When imaging with a color camera in light polluted areas, skyglow degrades image quality. This filter helps to block light emitted from streetlights and other ambient lighting. Made with Schott B270 glass, the filter's dielectric coatings enhance light transmission to bring out subtle color in galaxies and other faint deep sky objects, while anti-reflective coatings prevent star halos and minimize internal reflections. It is ideal for imaging colorful nebulae and galaxies by maintaining a neutral color balance. Every filter is individually tested for light transmission, and a graph of test results for your specific filter is included for your reference. This is a service unique to Astrodon. 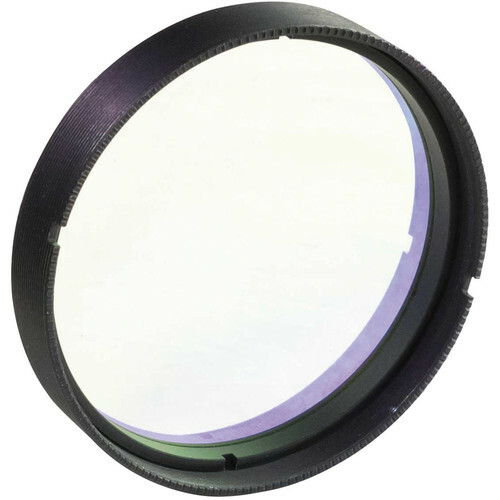 By fitting into the RASA's front optical window, the light is filtered before entering the optical tube, maximizing useable light and eliminating the need for a rear filter which can add length and weight to your astrophotography or astro-imaging rig.